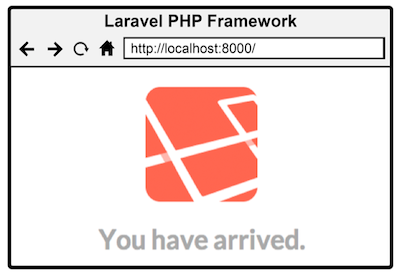 The following content is the fifth chapter of my new e-book titled “Laravel: my first framework“. This writing is copyright by Maksim Surguy. Unauthorized copy and distribution of this material is prohibited. When the code of the application grows, it becomes harder for the developer to plan new features and to maintain existing features. Up to this point in the book, all functional code of Laravel applications was put inside of “app/routes.php” file. To help with separating application’s features into smaller, manageable pieces Laravel allows the use of PHP classes called “controllers”. The concept of using controllers is present in many modern frameworks. In applications built with Laravel controllers play an important part of Model-View-Controller application architecture. Working together with Laravel’s routing mechanisms, controllers make maintenance, testability and expansion of the application a lot easier. In this chapter you will learn how controllers can help you in separating the code of the application and why they could be used when the application expands. You will take a look at two controllers that come with Laravel out of the box: BaseController and HomeController. Then you will learn about creation of your own Basic, RESTful and Resource controllers while using convenient shortcuts that they provide for managing application’s execution. After that, you will become a pro at combining Laravel’s routing with controllers. Finally, you will learn how to use routing conventions to pass parameters to the methods of the three types of controllers. Using controllers becomes necessary when your application has more functionality than just showing a couple web pages. As the code of the application grows, putting all application’s features in the routing file is not a wise option. Through the use of controllers – special PHP classes – developer can separate the functionality of the application into different classes and connect the functions inside of these classes to Laravel’s routing. Routing VS. Controllers? When developers come to MVC frameworks like Laravel they get a notion that their application should only use routes or only controllers. The concept of using routes and controllers could confuse some newcomers.While it is true that for very small applications it is possible to get by without even touching controllers, a better practice is to put the application’s functionality into controllers as the application’s features add up.The title of this sidebar is misleading on purpose. When you build a web application with Laravel, it is the harmony of routes and controllers working together that could make the application extendable, testable and maintainable. Using controllers is necessary for any growing application. With the flexibility that Laravel provides for routing to controllers’ methods you can start using controllers right away. Let’s compare two scenarios of application structure, one that uses just routing file (routes.php) to store the application logic and the other one – using controllers to do the same. You will gradually understand the benefits of using controllers as you read through the examples. Definition Application logic is a set of executable actions that the application follows to validate input, retrieve or store data. As an alternative to routes-only application Laravel provides you with a way to tell the routing to execute a member function – also called an “action” – of an existing PHP class instead of executing a function passed as an argument to a routing method. The actions could contain any application logic such as working with database or file system, redirecting the user to other pages within the application or simply showing an HTML page. The PHP classes that contain application logic and whose methods or “actions” are mapped to the application’s routing definitions are called “controllers”. Definition Controllers are PHP classes that contain application’s logic and are called from the application’s routing. Controllers contain methods called “actions” that direct the execution flow of a web application by working with application’s data (models), producing output (views) or redirecting. By creating a separate PHP class (controller) and specifying which routes in the routing file use its member functions you are able to take full advantage of MVC pattern in your Laravel applications. How does the application flow change in this case comparing to having application logic in the routing file? Let’s take a look below. Now that we have looked at the advantages of using controllers and have seen how they could integrate in the Laravel applications, let’s take a look at how Laravel applies this concept in action by providing two default controllers out of the box. When used together, these two controllers provide you with a small example of controller-based application architecture. Out of the box HomeController includes simple functionality to show a page to the user, while BaseController acts as a foundation for all application’s controllers. We will build our controllers on top of the default BaseController in this book but it’s worth knowing that you can create your own controller that serves as a parent to all controllers. Let’s look at the two default controllers and understand their purpose in a Laravel application. Note The controllers need to be connected to the routing mechanisms in order to be executed when the application runs. We will take a look at controller routing later in this chapter. Note When building applications that use controllers, BaseController acts as a parent controller and all other controllers should be extending BaseController. A good example of a BaseController’s child controller is HomeController that also comes with a fresh Laravel installation. Let’s take a look at this controller and its purpose next. While HomeController is a good starting point containing only one function for a demonstration of showing a simple page, it can easily be modified to contain more functions responsible for application’s homepage actions. But what if you wanted to go beyond the default controllers that come with Laravel out of the box? Let’s look at creating our own controllers in the next section. Creating a new controller in Laravel applications is as simple as creating a new PHP class that extends BaseController and placing it in the “app/controllers” folder. Let’s learn more about creation of new controllers while restructuring some of the code you have encountered previously in this book. 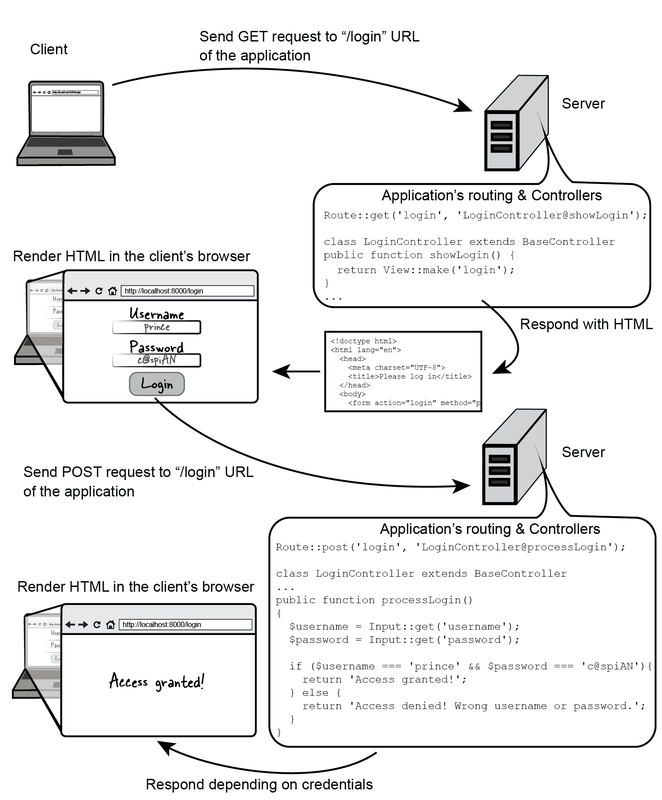 This application flow in the figure above uses a combination of routing and controller to process the request and display a view (HTML page). 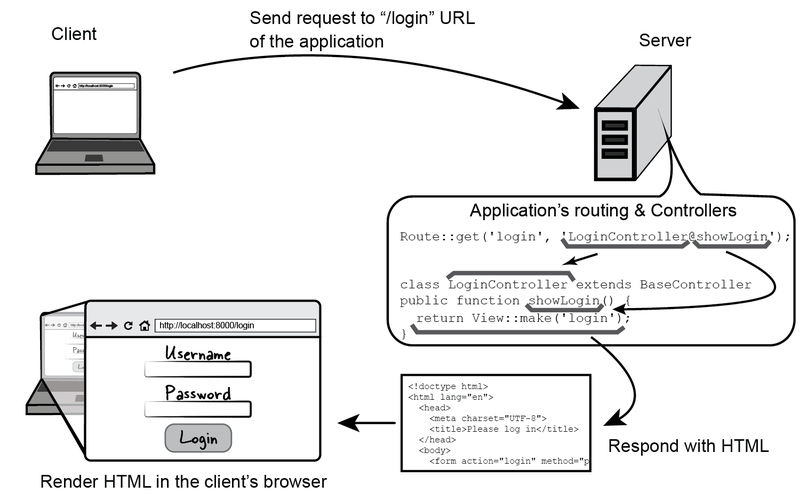 Because controllers are meant to contain related logic, the same controller could also be used to not only show the login page but also to process the form submission. Over the next few pages you will implement a login page flow by creating a new controller responsible for displaying a login page and processing it upon submission of the login form. 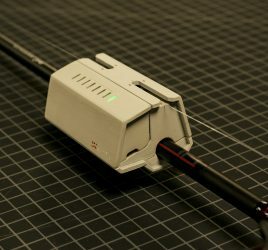 As it was mentioned above any new controllers should be extending the BaseController class by convention. To create a new controller you would need to create a new PHP class and place it in the “app/controllers” folder. Then all operations that the controller will execute should be placed in this new class’ methods. For now the LoginController would only show the login form to the user. We will add the functionality to process this form a bit later. 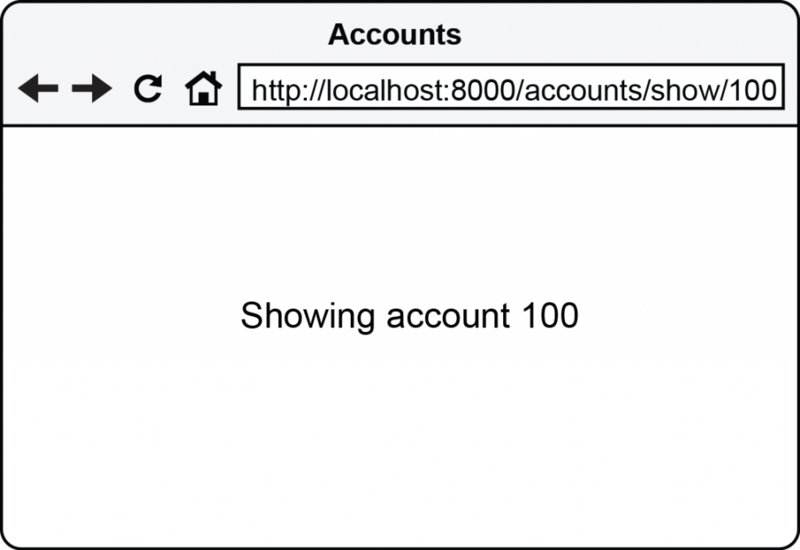 Now let’s define the routing for the single “showLogin” action of the LoginController. 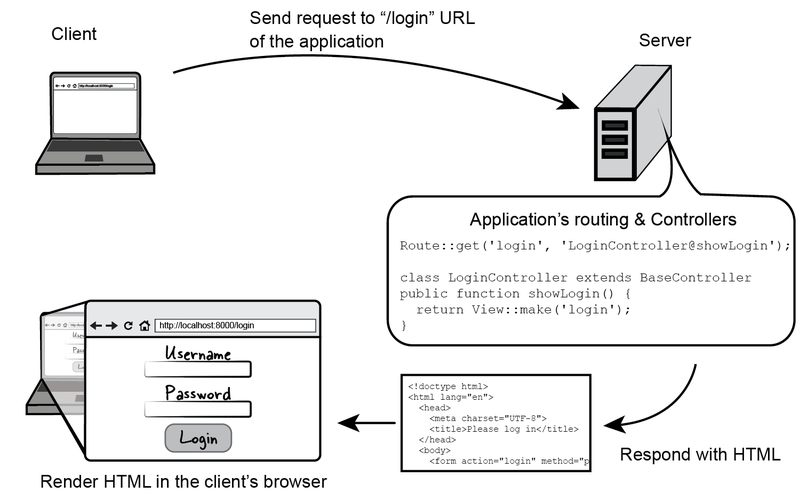 Having this simple controller functionality defined, we can connect it to application’s routing by specifying that the “showLogin” function of the “LoginController” class will be called when the user goes to the “login” URL of your application in the browser. Laravel comes with an easy way to specify which method of a controller will be called when a particular route gets called. Instead of passing a closure function to the routing methods like you have seen before, you can provide a string containing the name of controller and the name of the method that should be executed when the route gets called. This way of routing is called “explicit routing”. 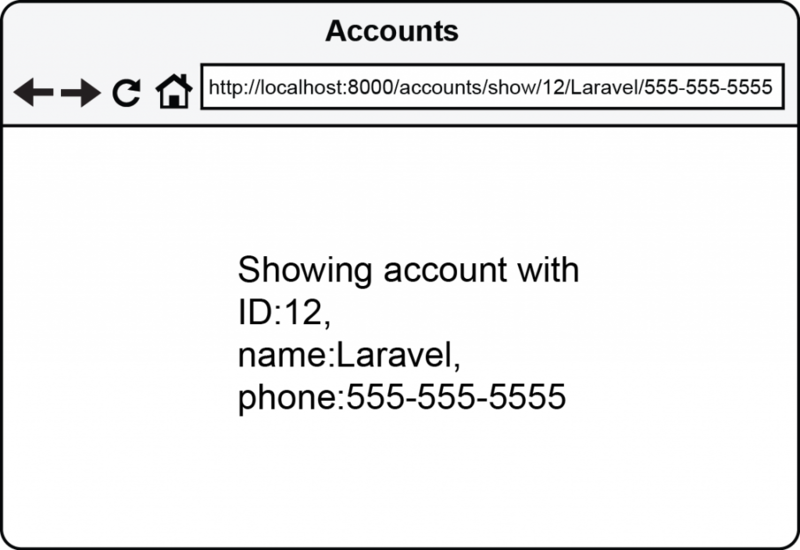 Laravel’s router looks for a match between the browser’s request (GET request to the “login” URL relative to the application) and a route definition. 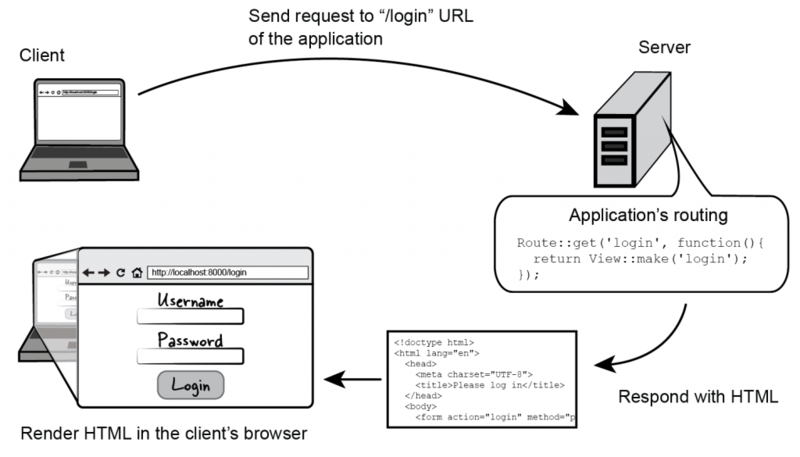 This simple application now responds to “login” route by executing a method from “LoginController”, nice! As you can see from the diagram above, using controllers and controller routing keeps the functionality of the application grouped into separate classes instead of polluting the routing file. What if you wanted to add more functionality related to user login to this application? A controller like LoginController demonstrates extendable application structure that benefits the developer when the application’s codebase is growing. Two methods or twenty, using controllers is a great way to group code related in its functionality together. When the application grows to a point where there are many controllers and each controller has a few different methods, explicit controller routing would not be always effective because the routing file would become very large. To get around this potential problem and to accommodate developer preferences Laravel provides a few other methods of combining controllers and routing together. These methods allow for using some of the best practices in modern web development while reducing the amount of code that needs to be created. Let’s learn about the three types of controllers available in Laravel, their differences and how they could benefit your application. While the purpose of controllers remains the same – to control the execution flow of the application – there are certain cases when using one type of controller could be more appropriate than using another. Basic controllers are great for simple functionality that might not be strongly related. RESTful controllers are very good when there is a need for making an API within the application. Resource controllers are a good fit for those cases when you want to have a consistent blueprint of managing a particular kind of data (resource). The answer to the question “which type of controller to use?” depends on the type of functionality that the controller will be executing and on the developer’s architectural decisions for the application. 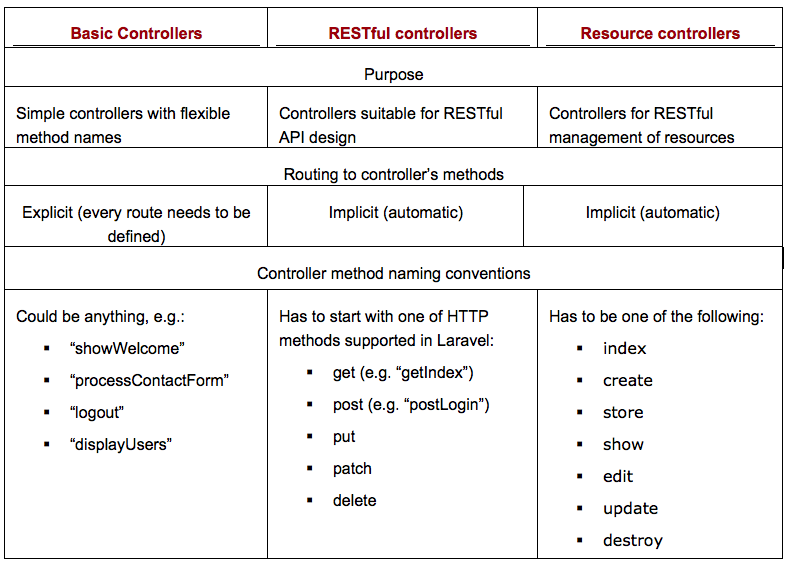 A short note on REST and RESTful controllers In the context of Laravel controllers “REST” (abbreviation for “REpresentational State Transfer”) and “RESTful controller” is an architectural pattern that requires the name of controller methods to describe what HTTP method (“get”, “post”, etc.) and what URL the method will be responsible for. Using RESTful controllers can shorten the amount of route definitions in the routing file significantly but on the other hand it could make the routing too implicit and harder to maintain. These three types of controllers are enough for vast majority of modern web applications. While at first glance you could say that Basic controller is all you need, method naming conventions for RESTful and Resource controllers allow you to use special routing shortcuts that you will learn a bit later in this chapter. In the next three sections you will get familiar with creating controllers of these different types and understand their differences in practice. Let’s start with the Basic controllers. You can create a Basic controller by making a new child class of “BaseController” and placing it in “app/controllers” folder. Basic controllers can have as many methods as necessary and these methods can have any name. Without knowing it, you created a Basic controller in section 5.3. As you might remember, the LoginController had two methods named “showLogin” and “processLogin” (listing 5.7). The method naming of LoginController’s methods corresponds to the Basic controller naming convention from table 5.1. As you will learn later in this chapter, the routing for Basic controllers needs to be explicit. Every method of a Basic controller needs to be specified for the router to know which URL is controlled by it. Following the RESTful method naming convention allows you to use a special routing shortcut that automatically binds the controller’s actions to the routes that match the HTTP method and the URL of the request. Putting the route definition like in listing 5.9 would automatically enable the URL “posts” relative to the application URL to execute the “getIndex” method, URL “posts/new” to execute “getNew” method and so on. That is only one line of code to route all controller’s methods! If the “PostsController” was a Basic controller, you would have to create seven route definitions, one for each method of the controller. As you can see from this example, using a RESTful controller can save a lot of lines of code in the routing file. Laravel is flexible about controllers, in fact so flexible that there is one more type of controllers that could be useful in certain situations. Let’s talk about “Resource Controllers”. Resource Controllers are named that way because they deal with “resources” – types of data that the application works with. For example if your application manages videos, these videos could be considered as a type of a resource. 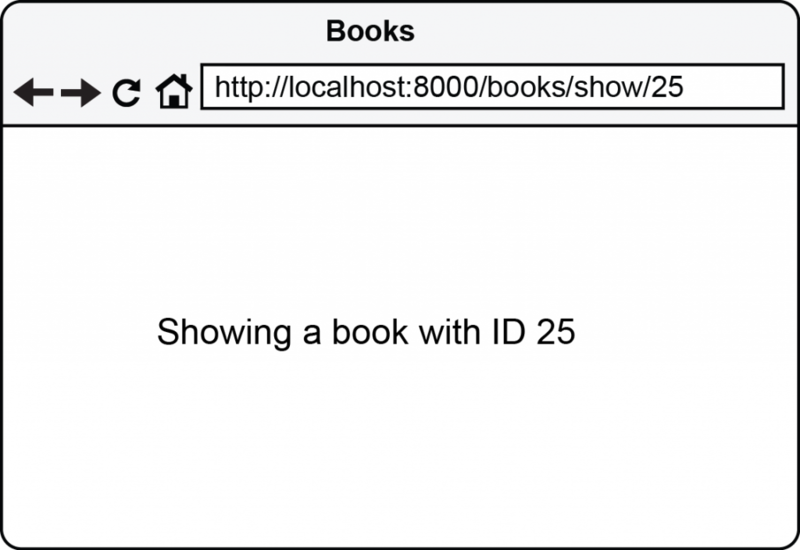 Or if an application manages addresses, they could also be viewed as a resource. Controllers that manage resources are called “Resource Controllers”. Definition Resource Controllers provide a consistent way of controlling creation, reading, updating and deleting for a resource. These seven actions are all methods that could be present in a Resource Controller. Creating a definition for a controller containing all these methods could take a bit of typing so Laravel comes with a tool to help you generate a blueprint for such a controller. While you can create a Resource Controller by hand, using the “controller:make” Artisan command accelerates the process by creating a skeleton for your controller. The seven actions of a Resource Controller need to contain some logic in order to be functional and what logic you put in to work with the application’s data is up to you. One of the main benefits of using Resource Controllers is that they help you create API-friendly controllers that work with application’s data. This is all that is needed to route a Resource Controller to its many methods! Just like the RESTful controllers and their automatic routing using this routing shortcut will save you a lot of typing. Great! You have learned about the three different types of controllers (Basic, RESTful and Resource controllers). You now know how to create them and in what regard they are different. When developing applications with Laravel controllers will be something you will use a lot so being a master in this domain will certainly help. While you have been introduced to controller routing on the surface, Laravel’s powerful routing techniques provide you with multiple ways to link controllers and their methods to URLs in your application. Let’s look at that in great detail in the next section. Over the next few pages we will learn about controller routing in greater detail. Besides routing to controller methods we will also review the concepts of passing parameters and using “filters” and how those important features of Laravel could be applied to controller routing. Let’s start with routing to Basic Controllers. Basic Controllers require the routing to be explicitly defined for each controller method. Only the methods that are defined that way would be executed when the browser sends a request to the application. You have seen it in the previous sections of this chapter but let’s reiterate on how the Basic controller’s methods could be connected to application’s routing. One advantage of using explicit routing is that when a developer looks at the routing file he or she can see exactly which methods will get executed depending on the type and URL of the request. As you see, routing to Basic controllers is not much different from passing a closure function as an argument to routing mechanisms like we have done in previous chapters of this book. In this case though, instead of writing out the whole function you can just point the routing definition to a method of an existing PHP class, controller. 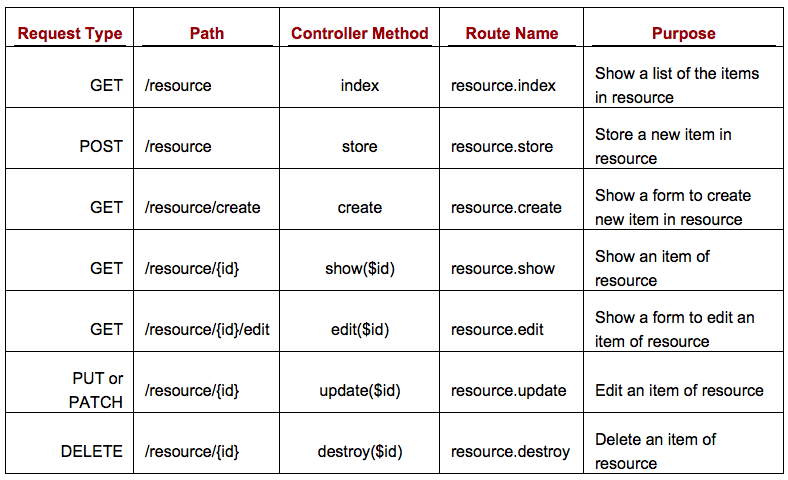 Routing to RESTful controllers is extremely simple as far as route definitions go. If you have a RESTful controller, for example called “AccountController”, you only need to put a single line to automatically assign all of its methods to a specified base destination. There is one exception to this rule – controller’s index route. Requests to the base destination will execute methods whose names end with “Index”. As you can see, in comparison to the Basic Controllers, routing to the executable methods of a RESTful controller is tightly dependent on the names of the controller’s methods. Because of that it is very important to name the methods properly when you use RESTful controllers. Now that we have learned the concept of routing to RESTful Controllers in Laravel let’s dive deeper into the world of controller routing. Let’s explore how routing to Resource Controllers works. As you can see from the table 5.2, four methods of a Resource Controller require a parameter “id” to be passed in to the methods: “show”, “edit”, “update” and “destroy”. In case with routing to Resource Controllers the parameter “id” gets passed in through the URL of the request, for example the URL “images/2/edit” would execute the method “edit” of the “ImagesController” with the $id parameter equal to 2. Passing parameters to controllers is something that we will explore in the next few pages. Route parameters allow your application to be very dynamic and thankfully passing a variable to a controller’s method is something that is very easy with Laravel’s powerful routing mechanisms. In fact, you won’t need to change any route definitions in order to pass parameters to RESTful and Resource controllers’ methods. Over the next few pages we will explore how the route parameters may be passed to each controller type available in Laravel. As you know, in Basic Controllers each method name has to have its own corresponding route definition. What is great is that to pass a parameter to Basic Controller’s methods you only need to specify where in the URL you are expecting a dynamic parameter and Laravel will take care of passing it to controller’s method. This looks very similar to the way it was done using routing without controllers, doesn’t it? Laravel promotes consistency in application architecture and that shows in the similarities between routing with parameters for a Basic Controller and passing parameters to closure functions in the route definitions. By using this technique you can pass as many parameters as you wish to as many methods as your Basic Controllers have. 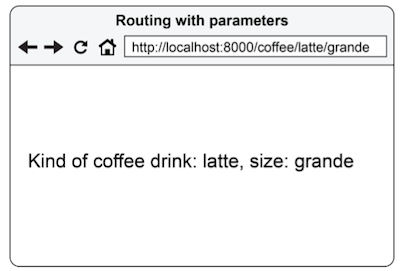 The methods of a RESTful controller are automatically routed by “Route::controller” definition therefore there is no way to specify which method of the RESTful controller should accept parameters and which method should not (listing 5.19). Laravel takes a unique approach to solve this problem by letting the developer pass parameters to controller’s methods without specifying them in the routing definition. As you can see, passing parameters to RESTful controllers is easy and logical without any modifications in the routing definition – just specify which methods will take the parameters and Laravel will do the rest for you. Let’s take a look at the last type of controller whose methods could take parameters – Resource Controllers. Methods “edit”, “update” and “destroy” behave similarly to the “show” method and do not allow you to pass more than one parameter. Laravel gives a lot of flexibility when it comes to applying these filters to application’s execution. Any of the filters defined in “app/filters.php” file could be attached to any methods of any controller. The process of attaching these filters consists of executing a special function on controller’s initialization. Let’s take a closer look at how filters could be applied to controller’s methods. You can attach a filter from the filters defined in “app/filters.php” file to the methods of a controller by specifying them in controller’s constructor. As you remember filters could be executed before or after the execution of the functionality that they are attached to. Now because the “auth” filter was provided as the first argument of “beforeFilter”, the closure function to “Route::filter(‘auth’)” in “app/filters.php” would be fired before the controller method(s) that the filter is applied to. Note You can replace ‘post’ with any HTTP request types supported in Laravel. With this filter firing before the user can run the “updateProfile” or “showUser” methods ensures that only logged in users can execute those methods. The flexibility of attaching filters to controller actions comes in very handy when you are building a large application with fine tuned access control. It allows you to get very creative with how you want to handle the requests to your application. Controllers play an incredibly important part of web applications. Using them to control the execution flow in your applications is irreplaceable if you want your applications to be maintainable, extendable and testable. In this chapter you have explored in detail how to create controllers of three various types that Laravel supports: Basic, RESTful and Resource. You have seen the advantages and disadvantages of each type of controllers, examples of their practical application and shortcuts that accelerate creation of Resource Controllers. You have also learned how to tell your application to route to these types of controllers and how to pass parameters to controllers’ methods. The information you have learned here in this chapter will be essential for the next chapters of the book. In the next chapter we will take a look at database operations in Laravel applications.